As I mentioned in an earlier post, My Own Financial Crisis, I thought I would compile a list of FREE things to do in Ottawa. It looks like this is going to be an ongoing list as I am sure there are many more free things to do in Capital City then I have listed here. Tuesday January 27th, 6:30 pm to 8:30 you can attend the Ottawa Toastmasters open house. You don’t have to participate, it’s free, and hey they serve refreshments. Join Professional Organizer, Angela Irvine for an informative workshop on the organizing basics. I'm already a bit OCD when it comes to organizing, so I'll probably skip this one. No really, torture, right here in Ottawa, and it’s free! Octopus Books presents three perspectives on torture in our time. What's Right With This Picture, is a cross-country photo exhibit to help launch International Development Week. It’s free and they will give you refreshments and snacks, woo-hoo! Join Marc-Boris St-Maurice, Executive Director of NORML Canada (National Organization for the Reform of Marijuana Laws) and Octopus Books for the National Resolution for the Legalization of Marijuana. It’s free, and you know they are going to have to have snacks, so get there early. Don’t worry it still does qualify for the Free Things To Do In Ottawa This Winter post, as all the food and veterinary expenses are paid for. The next Information Session is on Friday, February 6, 2009. I've been in Capital City for about five years now and I have never done Winterlude. I think this year will be different... as long as it really is free of course, the whole broke thing you know. 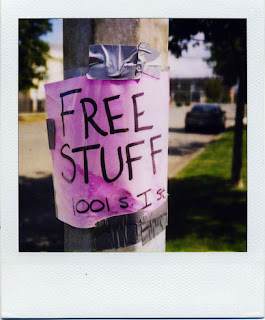 From what I understand it is always free, but who knows what they will actually let you look at. Well that's it for now, if you Dear Reader (if anyone actually reads this) have any suggestions, feel free to leave a comment and I'll periodically update this list. It's great that you are able to find out resources that are free and share them with the community.Some of the info you provided i thought were quite helpful for individuals that have low-income or no income at all. Thanks! Keep up the good work! Thanks for the comment - I hope you were able to enjoy some of the things on the list. I will have to do another update soon for this spring.